This Sunday, December 15, I will be part of a “Cross-Pollination Pop-Up” with fellow garden bloggers, Denise of A Growing Obsession and Dustin of non-secateur, at the Long Beach flea market. We’ll be selling an array of stylish, handmade garden items as well as plants, pots and miscellany. 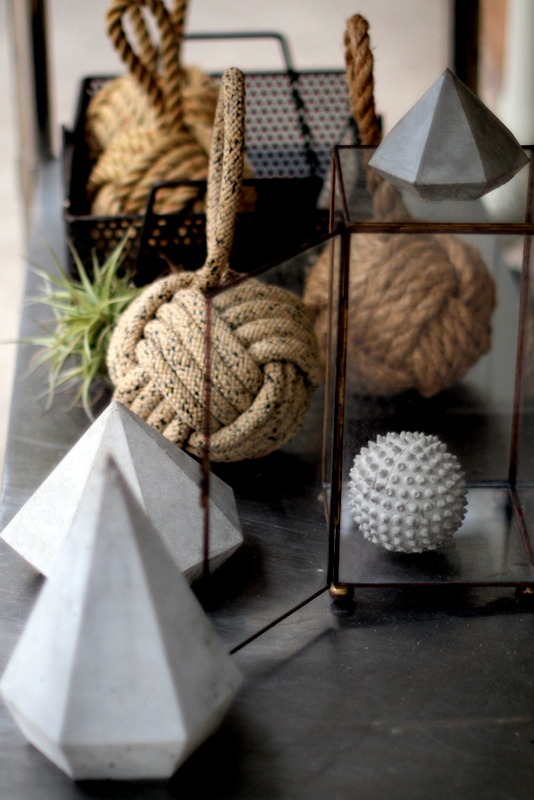 For example, above: Lovely vintage rope doorstops by Denise and cool concrete “gems” by Dustin … both have a simple elegance that would add texture indoors or out. 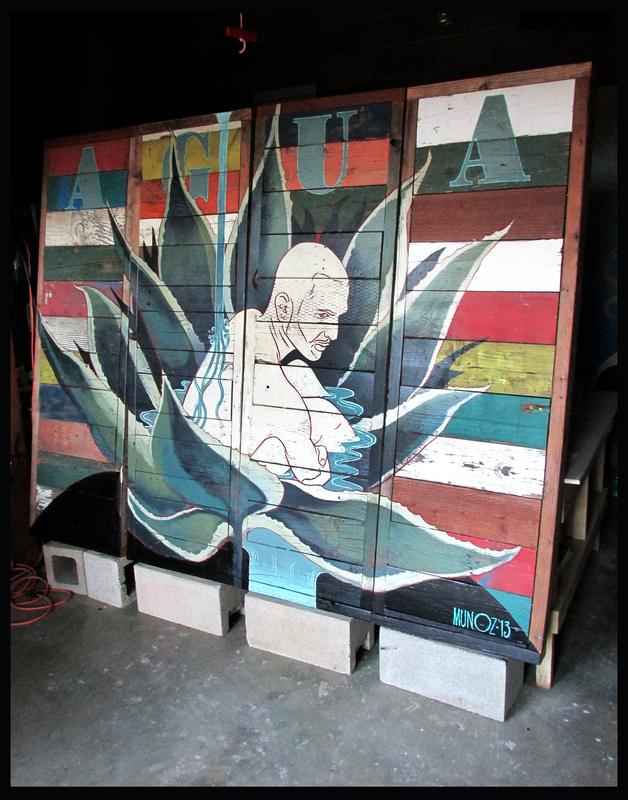 My contribution will be several art pieces, including my “portable mural”, ‘AGUA’. It’s made up of four separate panels, with a combined length of 81.25 inches; height is 63 inches. Each panel was constructed for me from painted reclaimed wood, and is approximately 20 inches wide; pigments are water-based commercial house paints. I think the random colors of the assembled wood background is very effective; overall I’m quite pleased with my painting. I think it would work well indoors or out, although I can see it really shining in a low-water garden … possibly installed in a rusted metal framework at the end of a gravel path … perhaps in a zig-zag installation. Paul thinks it would look great mounted over a fountain; I can tell he’s already hoping it won’t sell. If you’ve never been to the Long Beach flea, you should go! It’s not as pricey as Irvine and Santa Monica (that I can remember), nor is it as sprawling and crowded as the Rose Bowl. The best part? Three of the best darn (okay, cutest) garden bloggers in So-Cal will be together in one space, just this once, selling some very cool stuff to some very cool people. Yes, I mean you — stop by and say hi! Click here for more pics from Denise’s blog; click here for additional pics from Dustin’s. For more information, including discount coupons, etc., go to their website by clicking HERE. Good Luck! I’ve always enjoyed shopping there!